Each company takes into account at a certain time, to manage contracts automatically, ie to use dedicated softwares to create the document, to find it, to change the state (expired or valid) to enable quick generation reports and analysis. Q'Assist Contracts App provides the ability to track contracts with suppliers and customers centralized and fast, anytime, anywhere. Controlled access to information and privacy are 100% guaranteed. Regardless of the size or scope, any company needs to manage the contracts effectively, whether we have faced archive loss (flood, fire, etc.) or the pressing need to access information quickly and structured. With Q'Assist Contracts App the access is made in a short time, online, even if the contract was lost or destroyed in time. 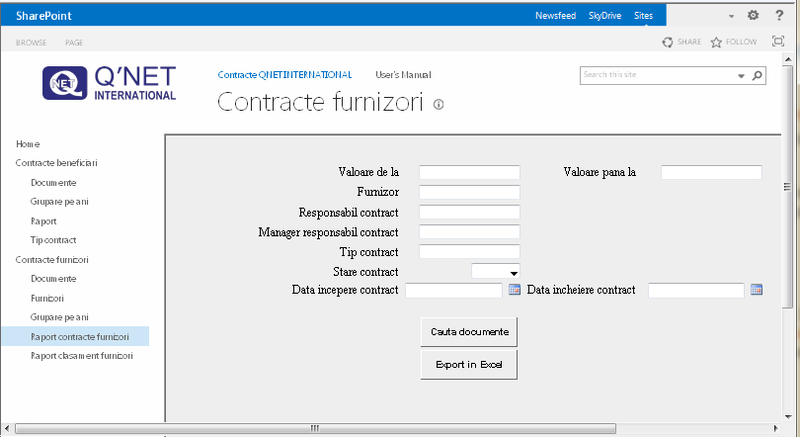 The average time for filing a contract, via this software, will be 3 minutes. The average time of search will be a minute. Archiving the contracts do not require special working skills from operators. The first step is to scan the document. The next steps are: add the supplier or the customer, choose the beneficiary department, attach the scanned document and fill in the document ( closing date, start date, expiry date, person in charge of contract, value, contract currency). Depending on the type of activity, new fields can be added. You have quick access in real time, from anywhere, anytime to all contracts. You can quickly and easily generate reports in Excel on which you can review the entire company. You receive automatically notification before the contract expires. You can easily manage the software immediately after the deployment. integration: Active Directory, LOB app.